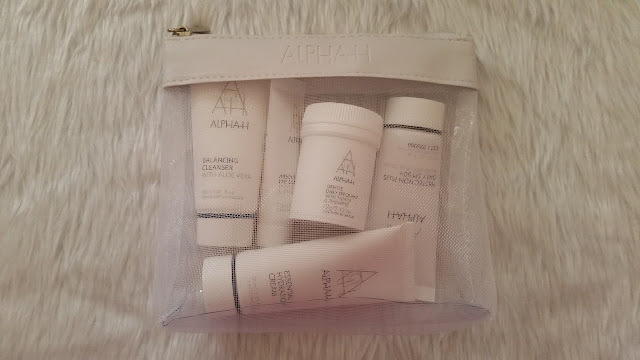 For the past 6 months I've been trialling products from a skincare brand called Alpha-H from FacialCo and today I'll be sharing my thoughts on a few products from this range. 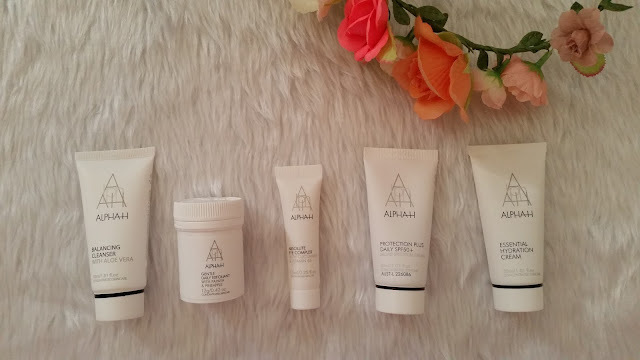 I trialled the 5-piece set of miniatures first because I wanted my skincare routine to completely start from scratch by using these products to cleanse, exfoliate, refresh, protect and nourish. They were also great for me to take with me on my short trip to Melbourne as they made for perfect travel-sized products. I managed to finish a few of these products before the others had finished which meant that some products were missing from my skincare routine but I guess that generally happens anyway, hey! The Balancing Cleanser was very creamy and gentle on my skin, I felt that it did a really nice job with removing my face makeup and didn't leave my skin feeling tight or uncomfortable afterwards. The aloe vera scent is quite subtle too so it isn't overpowering or likely to cause any irritations on sensitive skin. The Gentle Daily Exfoliant is a dry powder which turns into a smooth paste when mixed with water. It is a micro-exfoliating treatment with zero abrasion - it is seriously the gentlest exfoliant I have ever used! 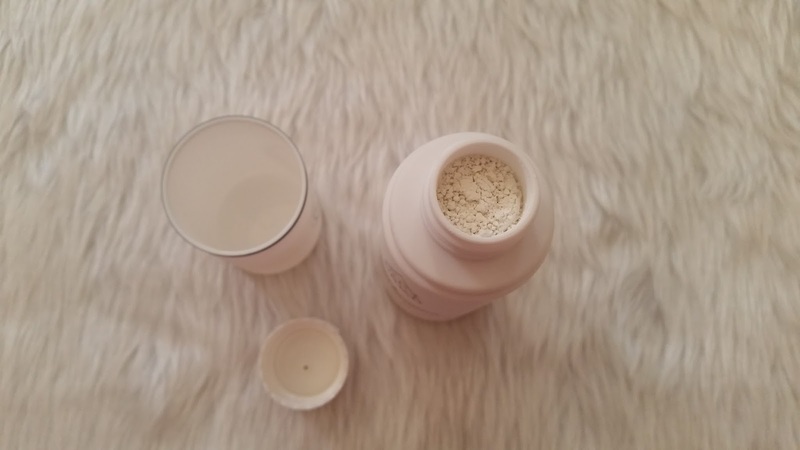 It was a joy to use each day because I normally would only exfoliate once or twice a week as my usual ones have microbeads or a grainy texture that feels too harsh to be used daily but this is the perfect exfoliator for dry and sensitive skin as it won't strip away too much of the superficial skin layer. The Absolute Eye Complex is used to refine the eye area to refresh and hydrate the delicate skin. It feels really cool on the skin, just like how a cucumber slice feels over the eye and its extremely lightweight. The Protection Plus Daily SPF 50+ is a sunscreen with a beige tint and with its SPF 50+ protection, it offers a very high shield against harmful UVA/UVB rays. I love how it isn't like a typical sunscreen that feels sticky afterwards, it feels more like a moisturiser as it is non-greasy and mattified. The Essential Hydration Cream was my go-to and it definitely helped with the hydration on my skin, one of my biggest problems as my skin tends to be on the dehydrated side, making it dry and flaky sometimes. 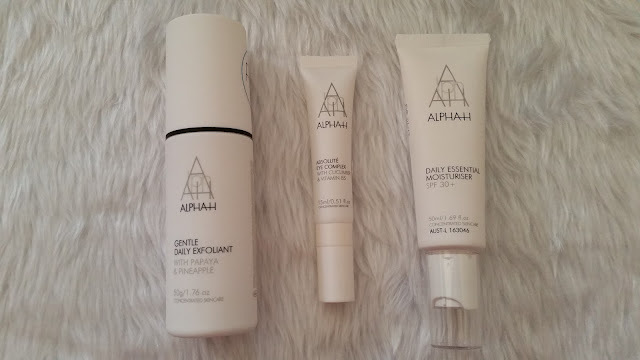 Two out of the three full-sized products were in the 5-piece skincare set which meant that when these ran/run out, I could continue using them as part of my routine, especially for the daily exfoliant which ran out fairly quickly so it was great that I had the full-sized one too! The Daily Essential Moisturiser is great for those with dry skin as it works to restore the skin as well as provide SPF sun protection to stop UV rays from penetrating the skin. It can be use on its own or underneath makeup as it is non-greasy and leaves the skin feeling smooth. This particular range and products are perfect for people with dry/sensitive skin like myself as these products have very mild scents and won't clog pores or cause breakouts/irritability. These products can be purchased from FacialCo, the little sister of Ry, Australia's biggest online skin, hair and beauty store. FacialCo provides luxury, professional skincare products at the lowest prices and aim to provide the ultimate customer experience with standard delivery being free Australia wide. What skincare brands are you currently using? Disclaimer: Products were provided for consideration. This is not a sponsored post, nor am I affiliated with any of the companies mentioned above. Links are not affiliate links. All opinions stated by me are 100% honest and free from bias. See more at http://www.questjen.com/p/disclaimer.html for full disclaimer.